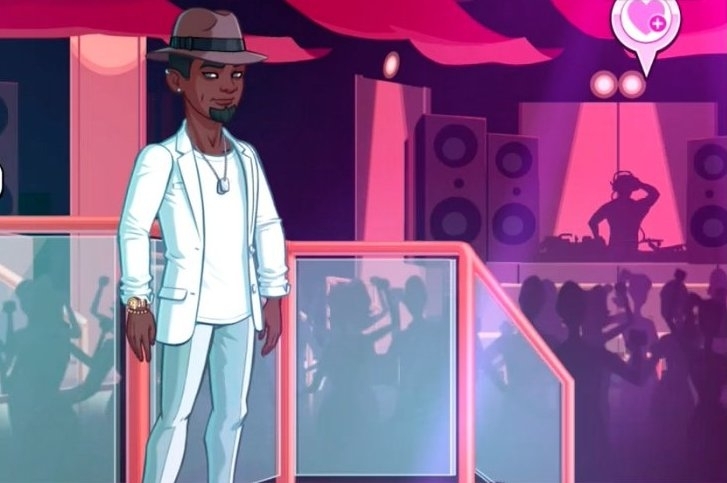 Playing Kim Kardashian: My Hollywood on iPhone and Android platforms has been a lot of fun. We're enjoying all of the benefits our stardom has to offer by making appearances, meet and greets and shooting commercials. If done properly, networking within the game can have a profound impact. We're going to share our tips and strategies to effectively use your charms to get what you want. 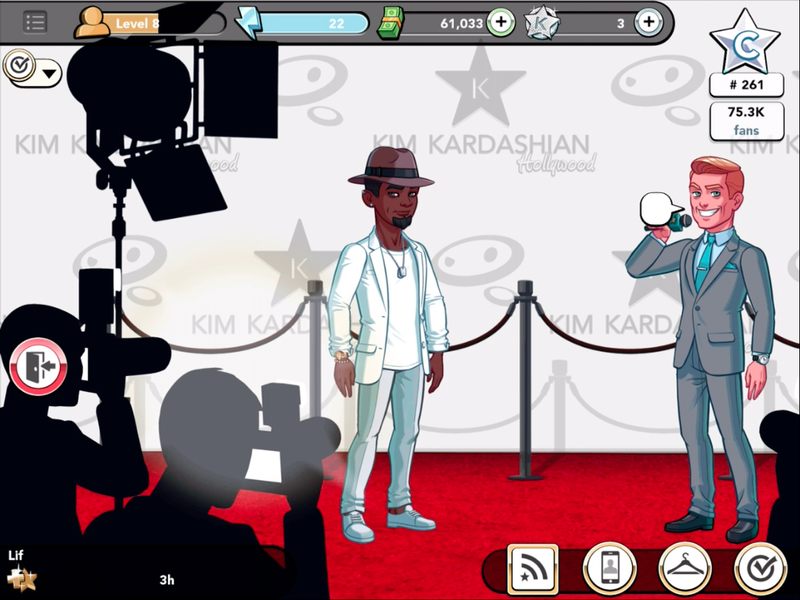 How do I network in Kim Kardashian: Hollywood? If you plan on making it to the A-list of celebrities, networking is the skill that needs to be developed. It's not enough that you have money in the game. You'll need to build up influence by taking advantage of every social engagement you're invited to. Frequently attend meet and greets at local bars and restaurants. Look at yourself as a unique selling proposition, and the ability to impress and sell your talents to people intrigued by your stardom is your trump card. For example, you agree to attend a grand opening of a hot new club called Lif in Miami. One of your duties is to be the life of the party and promote Immaculat vodka. There are a few ways you can successfully network with people at a social engagement like a bar or club; spend some money on drinks and people of interest will suddenly appear, looking to chat it up with you. If you're interested in getting to know that person, you can either flirt or add them as a contact. 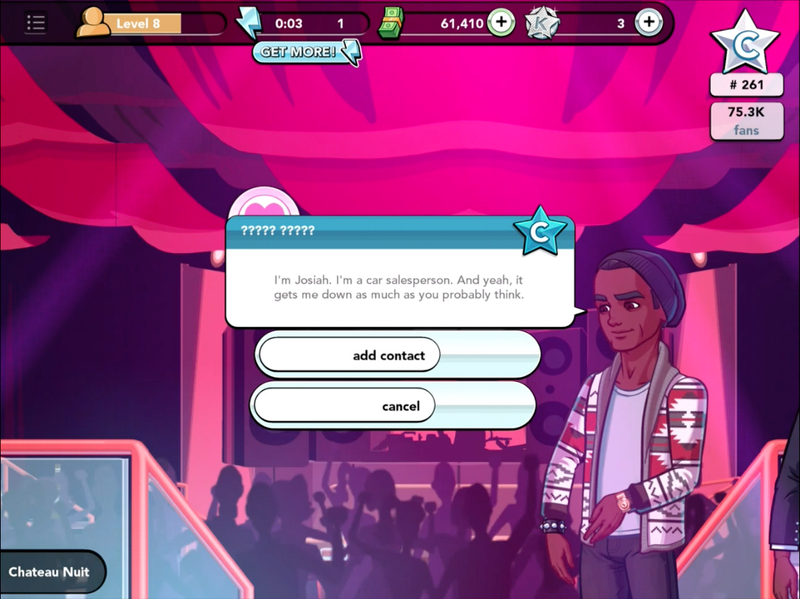 What differences are there between Acquaintances Vs. Flirtatious Contacts in Kim Kardashian: Hollywood? There's always work involved in maintaining a relationship, be it personal or professional. 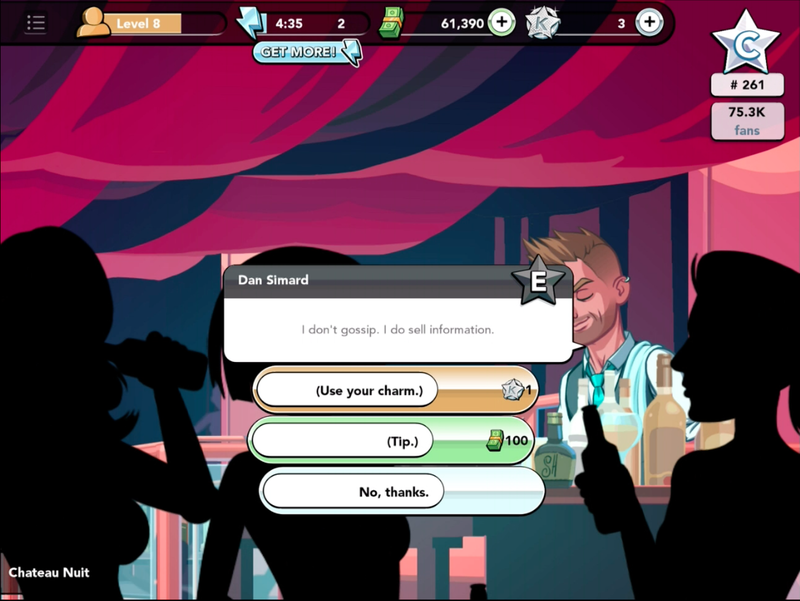 Networking is the path to stardom, and in this game you have two ways to categorize your networking relationships. Acquaintances are represented with a blue talk bubble, while flirtatious contacts are in red. It's up to you to determine how you want to build the contact. Flirting with someone has its benefit. If you meet someone who will speed along your climb to stardom, you can always call upon him or her for help, so long as you nourish the relationship through dates and gifts. Sending gifts to a romantic interest increases your romantic rating and enables you to change the appearance of your person of interest. Make sure that the person you date has a list rating close to or above your own for added benefit. Adding someone as a contact immediately puts that person in the acquaintance zone. Acquaintances are good to have but they require maintenance. Connect with them at the locations you initially met them at and they'll be happy to see you. Having a conversation will strengthen your relationship, allowing you to call in favors when needed. 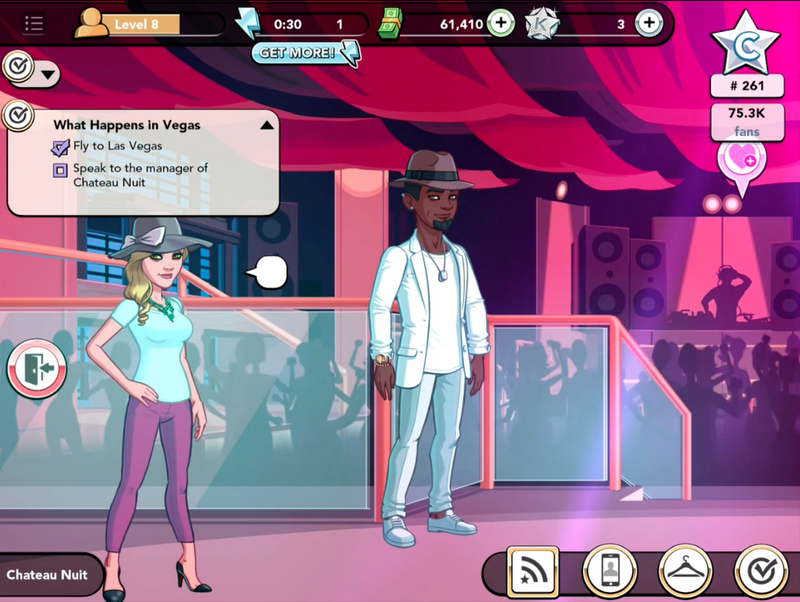 Is there a price to networking in Kim Kardashian: Hollywood? There's always a price to networking with people. You don't get something for nothing; networking contacts will require favors from time to time. Doing favors for your contacts will help grow the relationship. Every interaction with your contact presents an opportunity. Most times they want you to utilize your star power to promote their businesses. This is not a bad thing, as you're looking for exposure and any publicity is good. Take advantage of these opportunities, as they will help you in meeting new contacts. Throughout your social interactions, you will be afforded the ability to impress someone you're speaking with. Use your charms to get the desired effect and you'll get a more favorable response. You'll be astonished at how quickly people are impressed by your charm, and what was once impossible becomes very easy. If you don't have the charm points, spend a little cash and you'll get a response. No guarantee that it will be desired, but it will require that you do some work. Now that you've reviewed this guide, you're ready to build lasting relationships. Work with your contacts to achieve your stardom and reward them with gifts and favors to show your gratitude.